Whew, what a week. So much stuff happened! This past week, we had a major cold snap hit us and were faced with wind chills deep into the -30s. Which meant there wasn't much leaving the house happening. Which also meant I was able to sit at the painting desk for hours on end! 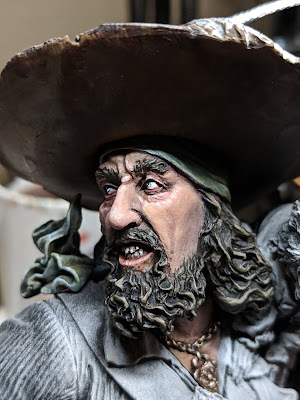 This week I completed all the dreadnoughts for my Adepticon list and got started on a bust of Captain Barbossa from Pirates of the Caribbean. 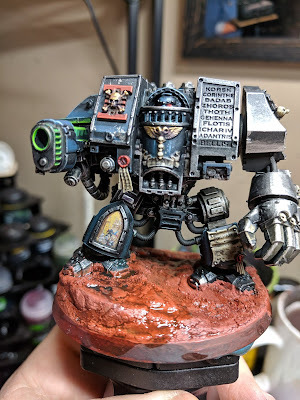 Wednesday night was all about the first Venerable Dreadnought. He and his brother (below) are both geared exactly the same. 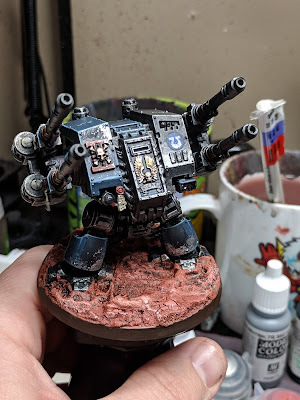 While both are more fancy than the standard dread, I went the extra mile on this one and painted a small mural on his shin guard. The painting on it is a tiny version of a piece of art in the Deathwatch codex of some Deathwatch vets fighting genestealers. I like the idea that perhaps this fellow is the marine pictured in the mural and that he fell in that battle. 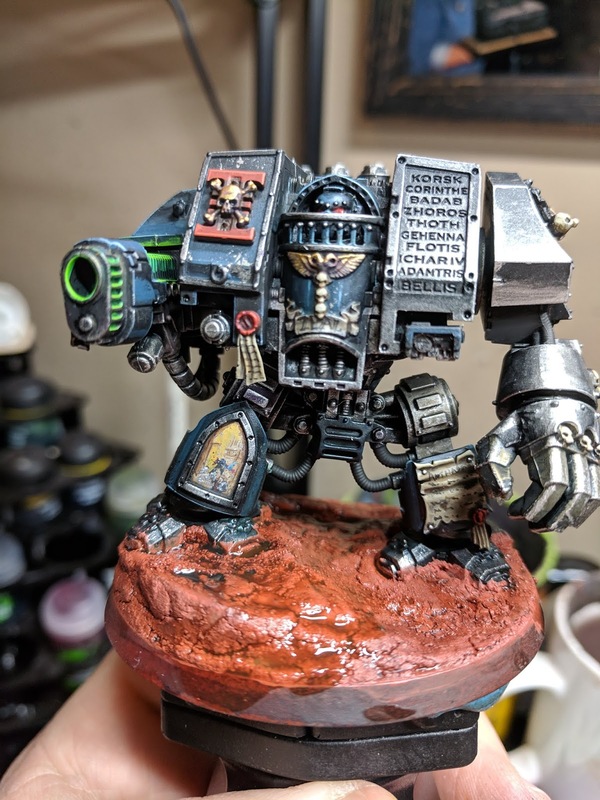 He was entombed in his new dreadnought body and his valor was then depicted on his shin guard to commemorate his deeds. The second venerable dreadnought was painted on Thursday. While not decked out in fancy murals, he is also decorated in trappings befitting a venerable dreadnought. This guy has also lost use of his original body while fighting Tyranids. He's also decorated with the names of various planets he's served on. Including Cadia, Caliban and Mars. Both he and the other Venerable are armed with Plasma, which has been painted with Lit glow in the dark pigments. While the glow isn't noticeable on the table, it is a neat little Easter egg. Friday was all about this fella. The Relic Contemptor Dreadnought has to be one of my favorite paint jobs of all the dreads. I am super proud of the way the highlighting on the main body turned out. He's currently armed with a Kheres Assault Cannon and Chainfist. But I have been running him as using an Twin Autocannon and have been eagerly waiting for the actual weapon arm to come back in stock at Forge World. Hopefully they do so soon, as they added range and damage is a big deal in this list. One fun thing I did for him was that while painting the chainfist, I mixed some purple into the yellow to get a deeper shadow on the hazard striping. I'd never tried that before, but am really pleased with the results. I'll have to do that more often. 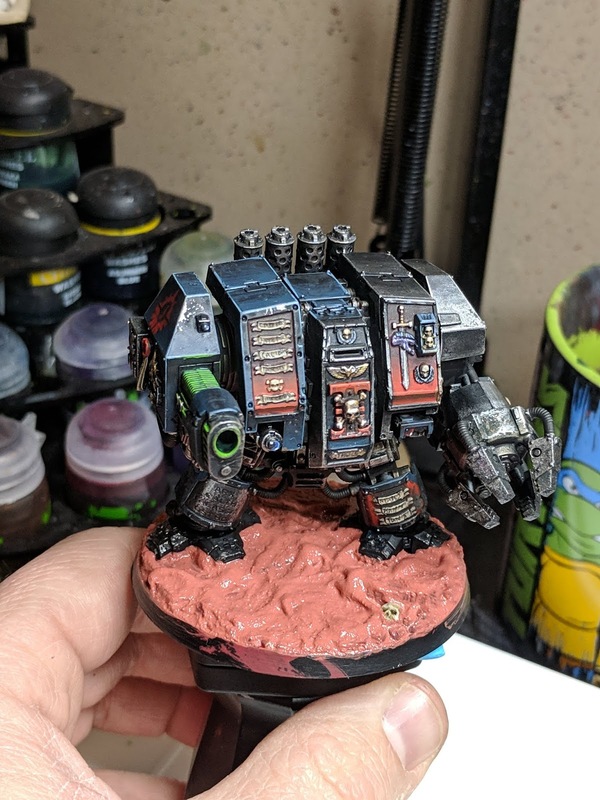 The Mortis Dreadnought has to be one of my favorites of all the dreadnoughts. Mainly because I had to do some minor, but super effective kitbashing in order to build him. 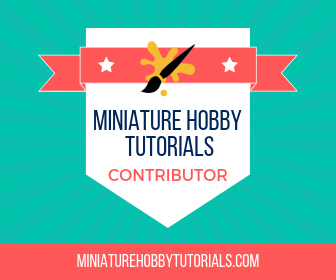 He's built out of a standard dreadnought kit and the autocannon bits from the Aegis Defence Line terrain kit. I had originally intended to build dreadnought style arms for him. After seeing the autocannons in person I instantly knew that they didn't need any customization. With the way they are mounted on him, it give him a very cool anti-aircraft gun feel. I painted him up in about 2 hours on Sunday, before I left for the game store for my game day. It ended up being super quick, probably because I had painted so many already and since he's lighter on the details. 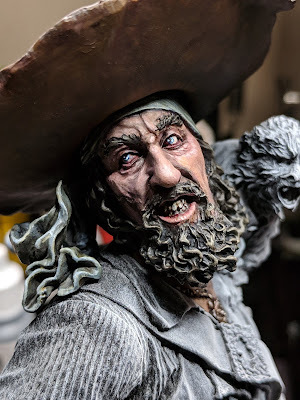 Sunday night I started playing around with the Pirate Fury bust from Nuts Planet. It was a nice change of pace from all of the army painting I've been doing lately. It took a bit to get back in the swing of things though. I'd not done a display quality piece since before GenCon in August and its been since June that I painted skin on something this size. After a little bit of struggle, I was able to get into the groove and really dig in. As of Monday night this is where he's at. I am really happy with him so far. His head and hat are nearly completely finished and that piece is loose so I can paint the upper body without them in the way. I'll likely get some more work done on him later on tonight. Probably by finishing off the hat's feathers. That's it for now though. 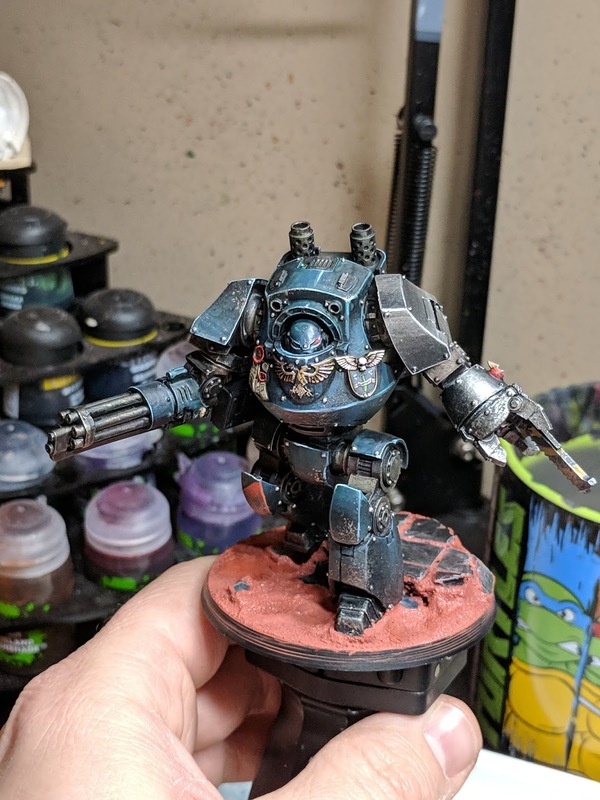 It feels good to have the dreadnoughts finished and ready for Adepticon. I still have the display board to finish up and that's next after Barbossa is finished. The time crunch is on. Only roughly 7 weeks til Adepticon!